*Mildew is a fungi. This simple microscopic organism is mold in the early stage and thrives anywhere there is a moist environment. Molds are necessary fungi found everywhere... both indoors and out. They are found in the dust and surfaces of every house. Even houses with ZERO moisture problems! These tiny microscopic organisms digest organic matter and reproduce by releasing tiny spores into the air. The spores are then transported by humans, pets and air flow. Growth is stimulated by warm, damp, and humid conditions. Dampness and inadequate ventilation are the biggest factors contributing to excessive mold growth. Where Do Mildews & Molds Grow? wallpaper, wood products, decaying leaves and other organic materials. Molds grow best where there is lots of moisture. Some areas of your home are always susceptible to mildew & mold growth. Routinely clean mildew & mold to help keep them under control. Seal on your refrigerator door. Surfaces on and around air conditioners. You might smell it. That distinct earthy, musty odor. Or you may see discolored patches on walls, tiles, grout & caulk lines or furniture... like those black or green blobs of gunk. But molds come in many colors, including white. If you notice condensation on surfaces (windows, pipes, etc.) or have had previous water damage, watch for mold. Squeegee the shower walls after using. Leave the shower curtain or door open when not in use. Leave the bathroom door open too. Monitor your grout lines and caulk for wear & tear. Make cleaning mold part of your cleaning routine. 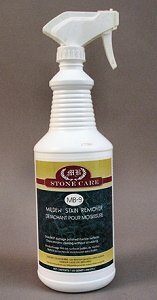 Cleaning mold & mildew on natural stone is safe with this product. It's made for natural stone! Plus, it works. 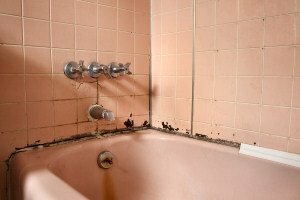 If there is mold growth in your home, you must clean up the mold and fix the water problem. If you clean up the mold, but don't fix the water problem, the mold problem will probably come back. To Prevent Mold From Growing - Control Moisture! Water leak? Fix it ASAP. Spill? Wipe it up right away. Keep an eye on your roof gutters. Make sure the ground slopes away from your building foundation. Keep your humidity below 60%. Condensation on your windows, walls or pipes? Dry and reduce the moisture source. Utilize water resistant building materials such as tile, natural stone, deep sealed concrete, galvanized or stainless steel hardware, indoor/outdoor carpeting, waterproof wallboard, water resistant glues, etc. Keep an eye and nose on problem spots such as your bathroom or laundry room for moldy odors. Disinfect often with a mildew remover. Steam from the bathroom or kitchen. Damp basements and crawl space. Poor or improper ventilation of combustion appliances. Loose or missing caulk & grout. It's impossible to get rid of all mold but mold spores will not grow if moisture is not present. Impractical to eliminate the moisture source? Use this mildew stain remover for cleaning mold & mildew and to keep the moisture under control. It's IMPORTANT to check your grout and caulk to make certain they are water tight. Continue to watch the area for new mold growth and signs of moisture. You may have more work in store. Mildew is mold in its early stage. Molds are a type of fungi. There are between 50,000 and 250,000 different types of fungi. Over 1,000 different kinds of indoor molds have been found in U.S. homes. They are part of our natural environment. Outdoor, molds play a part in nature. 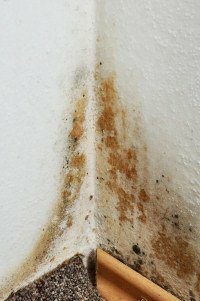 Indoor, mold growths should be avoided. Molds reproduce by means of tiny spores. These spores are invisible to the naked eye. Mold spores spread easily by air currents, pets and people. Molds can survive for a long time. They need water or moisture to grow. Control moisture to control mold! Higher temperatures increase the rate of mold growth. Fungi have adverse effects on health. They also cause considerable damage to buildings.